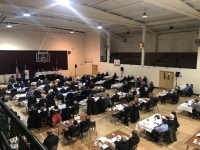 The 2018 County Convention was held in O’Loughlin’s Gaels GAA Club on Monday night. A large crowd was in attendance to bring the year to a close. The meeting opened with the report of Secretary Conor Deniffe followed by the annual financial report delivered by Treasurer Barry Hickey. Chairperson Jimmy Walsh then addressed the assembled convention to deliver his first address as Chairperson. Mr Walsh acknowledged the role of all clubs and the volunteers throughout the county and highlighted all the great work being done at club and county level, despite the many challenges facing rural areas. The meeting oversaw the return of the outgoing board, with only one election that of Leinster Council representatives. There were four candidates and the successful candidates were Willie Dempsey (Thomastown) and Val Malone (James Stephens). Click below for the Chairperson, Jimmy Walsh's address to Convention and the report of County Secretary, Conor Denieffe. The annual Bord na nOg convention was held in Nowlan Park on Thursday night last. Click below for report. The Kilkenny GAA Annual Convention too place last Thursday (Dec 14th) in O'Loughlin Gaels GAA Club. The 2017 County Convention takes place in O'Loughlin Gaels on Monday evening next at 7.30. The Convention will see several changes in Officer positions under the GAA's 5 year rule. Chairman Ned Quinn, Secretary Jimmy Walsh, Vice Chairperson Conor Denieffe, PRO Seamus Reade and Development Officer Val Malone all step down from their current roles. Click on Read More below for Secretary Jimmy Walsh's comprehensive report and the nominations for 2018 Officer positions. The Convention will also hear the financial report from Treasurer Barry Hickey which will show a surplus income over expenditure of 183k before loan repayments of 120k. The draws for the 2018 League/Championships will also take place at Convention. The 2016 annual convention was held on Thursday night with approximately 150 attending. Chairman of O'Loughlin Gaels, Brian Murphy, welcomed delegates to Convention and wished all well for the business in hand. Secretary's Report, Treasurer's Report and Sub-committee reports were all dealt with. Click on Read More below for more details. The draws for the 2017 senior, intermediate and junior leagues were all made during convention.